Furniture styles in America changed gradually over the course of years. As Federal cabinetmakers slowly adopted the changes in design which were being suggested by British designers and architects, furniture frequently exhibited stylistic elements of two periods. Such furniture is often referred to as " transitional" in style. Our American Federal ClassicsTM replica transitional Boston wing chair has square moulded front legs which are reminiscent of the late Chippendale styles. Yet the shape of the wings and arms, and particularly the gentle arched back, indicate that the original of this beautiful chair was made early in the Federal period, probably around 1790. Our replica duplicates exactly each beautiful curve of the original frame as well as each construction detail-from the birch and pine secondary woods to the perfectly scaled Honduras mahogany stretcher base. 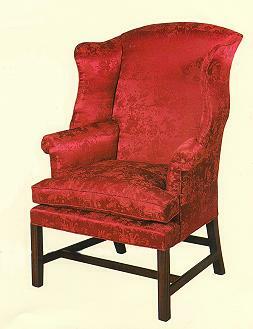 The design of this classic Massachusetts easy chair ranks it among the finest examples of early Federal craftsmanship.